From June 18 through June 22, 2011, volunteers from The Buckeye Trail Association, and local volunteers held a "Work Party" on the Trail. 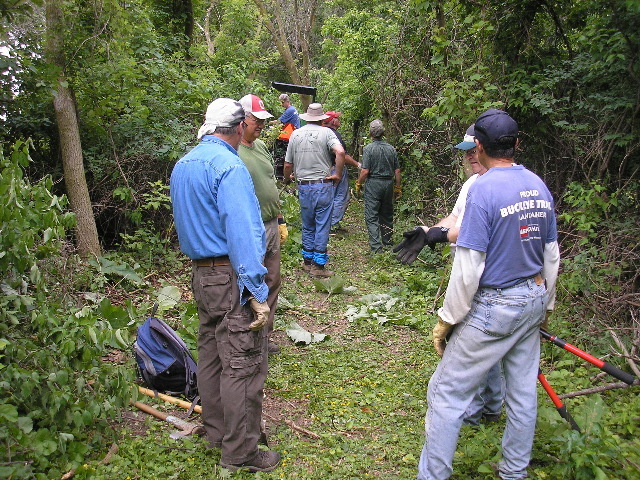 The objective was to clear the last segment of Trail in the Eastern side of Henry County. And after all the dust had settled, the last mile of the trail in Henry County was finally cleared ! Thanks to the 10 Buckeye Trail Volunteers, and the 12 local volunteers who worked their magic on the trail and cut through all the dense underbrush to finally complete the final section of trail to open in Henry County. As a result of this effort, the Buckeye Trail, and The North Country Trail is now cleared all through Henry County from West To East! The Trail now Connects Independence Dam in the West to Providence Dam in the East! Approximately 20 plus miles of trail now open! The Work Party went well, and according to Joe Krueger, Henry County Park District Commissioner, several ladies from St Patrick's Catholic Church in Providence cooked breakfast for them each morning except Sunday. Breakfast was so good, they stayed Tuesday night to have breakfast before leaving Wednesday morning. Kind thanks to all the Trail Volunteers, and also the ladies from St. Patrick's! Click on the photos to the right to view slide show. Photos supplied by Bob Morrison. Thanks again to all!